MEL students apply their skills to optimize a solar-powered microgrid. Three students in the Master of Engineering Leadership (MEL) in Clean Energy Engineering program developed technical and financial models for a solar-powered microgrid on the UBC campus as part of their capstone project. Funded by the Canada Foundation for Innovation and the BC Knowledge Development Fund, the planned $11.6-million microgrid will connect a 1-MW solar canopy on the roof of UBC’s Thunderbird Parkade to a high-voltage electric vehicle charging infrastructure, a hydrogen production and fuelling station, and battery-based energy storage. 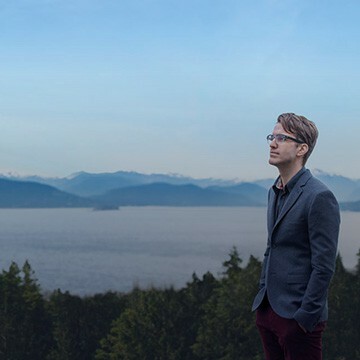 “Our goal was to determine the financial feasibility of a microgrid on campus that would reduce the carbon footprint of transportation at UBC,” says M.K. Anand, one of the three MEL students who worked on this project along with Balpreet Kukreja and Bernardo Ruz. He says that the team also wanted to explore ways to optimize the proposed system to see if it could be financially and technically feasible as a stand-alone venture beyond campus. 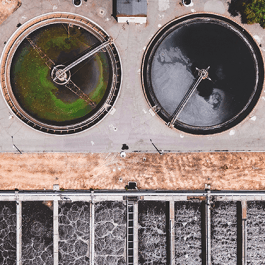 Given that the net present value of the first iteration of the model was negative, the group looked at every aspect of the system to see where they could modify operations and introduce additional revenue streams. 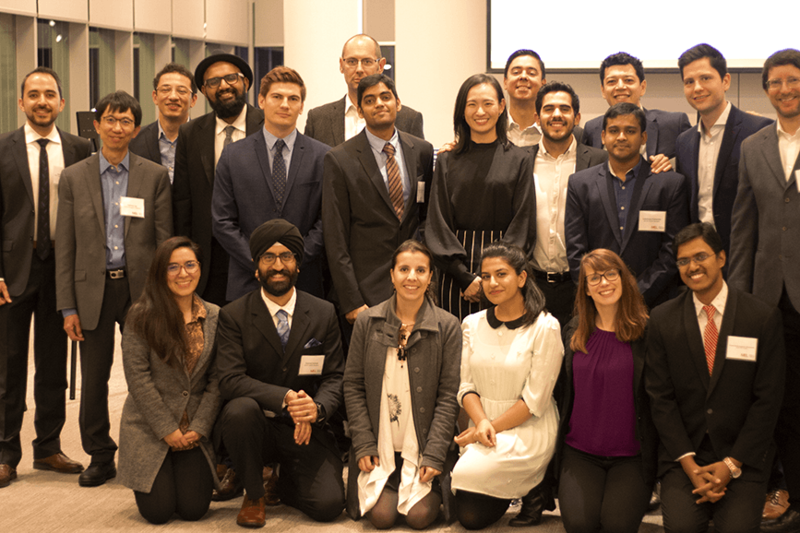 Balpreet says their first step was to alter the mix of electric vehicle charging stations: stations with a slightly slower charging speed than originally envisioned could still meet the operational goals of charging UBC’s fleet of electric vehicles and parkade visitors’ electric cars at a reduced cost. They also revised the size of the energy storage to reduce the amount of energy that would need to be purchased from the utility company during peak demand hours. The group used data from existing electric vehicle charging stations at UBC and around Vancouver to inform their model. They looked at daily solar data to calculate how much energy the system could realistically produce and they consulted with organizations across the Lower Mainland that had installed comparable systems. 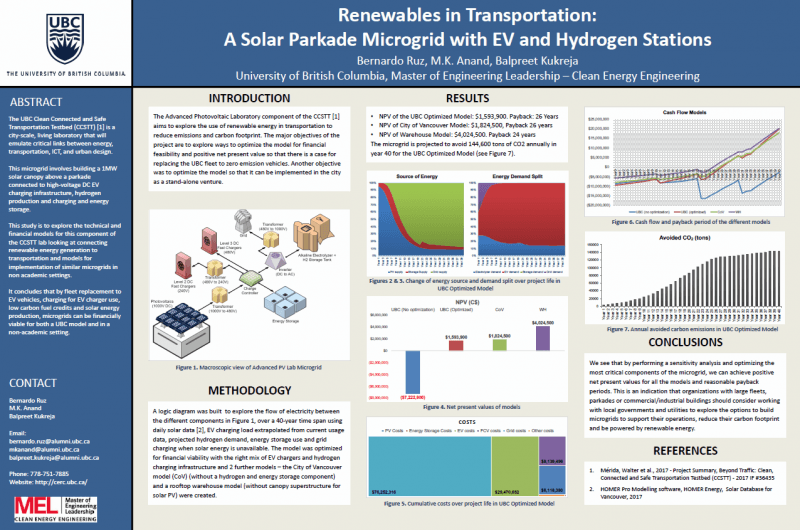 The students then used this information to optimize the planned UBC model and to create two new models – one without the hydrogen fuelling station and one without the higher-cost canopy superstructure for solar energy panels. The three optimized models have positive net present values ranging from $1.6 million to $4.0 million, with a payback period of 24 to 26 years. The students were pleased they were able to create three optimized models with positive financial returns. “It was exciting to see how a few tweaks to the project could make it economically feasible,” says Balpreet. Develop the technical, business and leadership skills needed to generate sustainable energy solutions.